At the end of the recent U.S. Trip, the European Wilderness Society visited the Black Canyon of the Gunnison National Park in Colorado. 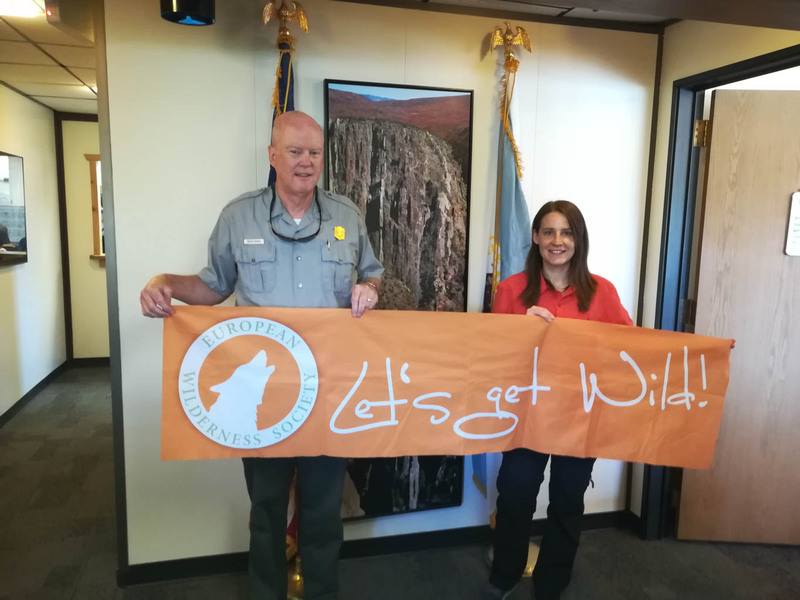 We met with the National Park’s Superintendent Bruce Noble as well as with the Park’s Ecologist Danguole Bockus and District Ranger Ryan Trush. Informative discussions about wilderness stewardship issues and a short excursion down the canyon offered a comprehensive overview of the Wilderness. The Black Canyon of the Gunnison National Park hosts a 15 599 acres, about 6 300 ha, large Wilderness. The way the National Park Service stewards wilderness differs in various ways from the way the U.S. Forest Service does. The National Park Service has a strong focus to manage their wilderness according to their wilderness character. Differences in the agency’s wilderness stewardship for example appear when it comes to acces. Horeses are just allowed on specific trails, which is handeled similarly in the Forest Service. In the Black Canyon of the Gunnison Wilderness, horeses are only allowed on one designated trail. A major difference is the National Park Service’s handling of hunting. The agency neither allows hunting in their National Parks, nor in their Wilderness. However, it is allowed in their recreation areas. The National Park Service also prohibites the use of drones on their territory. Only the National Park Service office in Washington D.C. grants special permissions. However, rules for motorised used, such as chain sawas, are theoretically the same as in the Forest Service. The Bureau of Land Management is responsible for the adjacent Wilderness of the Gunnison Gorge. There are also some differences in the Wilderness stewardship between this agency and the National Park Service. The biggest challanges of the current management of the Black Canyon of the Gunnison Wilderness is the rising number of visitors. Even though the routes down the canyon are very demanding and strenuous. The National Park Service installed a permit system in in the Wilderness in the 1990ies. These permits are free of charge and significantly limit the number of one and multi-day visitors per route. However, the system depends on self-registration and pick up of the permits on the previous day. A lack of pre-planning leads to a higher demand of acces than can be granted. The maximum number of people allowed per day depends on the route and varies from 15 to 22. A lottery system is in use to distribute the permits for the particularly poplular Red Rock canyon. The permin system also includes river rafters as well as fisherman. Particular attention is given to the concept of Leave No Trace within the canyon Wilderness. The backside of the permits include a list of the most important Leave No Trace principles. However, the National Park’s management had to install two pit toilets at the bottom of the canyon within the Wilderness. This is necessary as the according disposal of human waste is not possible there due to the proximity to the river. Next to these toilets, a chain, installed before the designation of the Wilderness, for the safety on one route and some fixed climbing anchors are the only permanent structures in the Wilderness. Commercially guided climbing is an issue the management is currently taking a closer look at within their new version of their Wilderness and Backcountry plan. The Rangers of the National Park of the Black Canyon of the Gunnison also carry out their duties in the Wilderness of the park. The park also employs climbing rangers, which work in the Wilderness for the most part. The rangers usually patrolle hiking routs at least once a week. The climbing routes show a higher number of pattrols. Every park ranger is entitled to law enforcement as well as for search and rescue activities. Trail maintenance works as well as snow patrol are main ranger duties in winter. Kalkalpen National Park celebrates 20th anniversary!